16th Regiment, Kentucky Infantry Overview: Organized at Camp Kenton in fall of 1861 and mustered in January 27, 1862. Attached to 18th Brigade, Army of Ohio, to March, 1862. Unattached, Army of Ohio, to November, 1862. District of West Kentucky, Dept. of Ohio, to June, 1863. 2nd Brigade, 3rd Division, 23rd Army Corps, Army of Ohio, to August, 1863. 1st Brigade, 2nd Division, 23rd Army Corps, to April, 1864. 1st Brigade, 3rd Division, 23rd Army Corps, to March, 1865. 1st Brigade, 3rd Division, 23rd Army Corps, Dept. of North Carolina, to July, 1865. Service: Nelson’s Expedition into Eastern Kentucky November, 1861. Action at Ivy Mountain November 8. Piketon November 8-9. Returned to Camp Kenton and duty there and near Maysville, Ky., till March 2, 1862. Moved to Piketon March 2 and duty there till June 13. Moved to Prestonburg June 13, thence to Louisa July 15, and duty there till August. Moved to Covington, Louisville and Bowling Green, Ky., August. Duty there, at Shepherdsville, West Point and Munfordsville till December. Operations again Morgan December 22, 1862, to January 2, 1863. Duty at Lebanon, Munfordsville and Glasgow, Ky., till August, 1863. Operatioans against Morgan July 2-26. Burnside’s march over Cumberland Mountains and Campaign in East Tennessee August 16-October 17. At Loudon September 4 to November 14. Knoxville Campaign November 4-December 23. Kingston November 7. Lenoir November 14-15. Campbell’s Station November 16. Siege of Knoxville November 17-December 5. Near Kingston November 24-December 4. Mossy Creek, Talbot Station, December 29. (Regiment re-enlisted at Mossy Creek December 27, 1863.) Moved to Kentucky January, 1864, and Veterans on furlough February and March. Ordered to Camp Nelson, Ky., April 16; thence march to Knoxville, Tenn., and to Red Clay, Ga., and joined Sherman. Atlanta (Ga.) Campaign May to September. Demonstration on Rocky Faced Ridge and Dalton May 8-13. Battle of Resaca May 14-15. Cartersville May 20. Operations on line of Pumpkin Vince Creek and battles about Dallas, New Hope Church and Allatoona Hills May 25-June 5. Operations about Marietta and against Kenesaw Mountain June 10-July 2. Lost Mountain June 11-17. Muddy Creek June 17. Noyes Creek June 19. Cheyney’s Farm June 22. Olley’s Creek June 26-27. Assault on Kenesaw June 27. Nickajack Creek July 2-5. Chattahoochie River July 6-17. Peach Tree Creek July 19-20. Siege of Atlanta July 22-August 25. Utoy Creek August 5-7. Flank movement on Jonesboro August 25-30. Battle of Jonesboro August 31-September 1. Lovejoy Station September 2-6. Operations in North Georgia and North Alabama against Hood September 29-November 3. Moved to Nashville, thence to Pulaski, Tenn. Nashville Campaign November-December. Columbia, Duck River, November 24-27. Columbia Ford November 29. Battle of Franklin November 30. Battle of Nashville December 15-16. Pursuit of Hood to the Tennessee River December 17-28. At Clifton, Tenn., till January 15, 1865. Moved to Washington, D.C., thence to Smithville, N.C., January 15-February 9. Operations against Hoke February 12-14. Near Smithville February 16. Fort Anderson Feburay 18-19. Town Creek February 19-20. Eagle Island February 21. Capture of Wilmington February 22. Campaign of the Carolinas March 1-April 26. Advance on Goldsboro, N.C., March 6-21. Occupation of Goldsboro March 21. Advance on Raleigh April 10-13. Occupation of Raleigh April 14. Bennett’s House April 26. Surrender of Johnston and his army. Duty at Greensburg, N.C., till July. Mustered out July 15, 1865.Regiment lost during service 2 Officers and 50 Enlisted men killed and mortally and 5 Officers and 131 Enlisted Men by disease. Total 188. 28th Regiment, Kentucky Infantry Overview: Organized at Louisville and New Haven, Ky., October 10, 1861, to May 9, 1862. Attached to 16th Brigade, Army of Ohio, January-February, 1862. 22rd Independent Brigade, Army of Ohio, to August, 1862. Dumont’s Independent Brigade, Army of Ohio, to October, 1862. District of Louisville, Ky., Dept. of Ohio, to November, 1862. Clarksville District, Western Kentucky, Dept. of Ohio, to June, 1863. 1st Brigade, 3rd Division, Reserve Corps, Army of the Cumberland, to October, 1863. Unattached, Dept. of the Cumberland, to April, 1864. 1st Brigade, 2nd Division, 4th Army Corps, Army of the Cumberland, to May, 1864. 2nd Brigade, 2nd Division, 4th Army Corps, to August, 1865. Dept. of Texas to December, 1865. Service: Duty at Shepherdsville, Ky., October to December, 1861. Moved to New Haven, Ky., and guard Louisville & Nashville Railroad and Lebanon Branch and at Bowling Green, Ky., and Franklin, Ky., till July, 1862. (A Detachment at Gallatin.) Operations against Morgan July 4-28. Lebanon July 12. Attack on Gallatin August 12 (Cos. “A,” “B,” “D,” “E” and “F”). Guarding railroad and operating against guerrillas between Green River and the Cumberland River and Louisville & Nashville Railroad till December, 1862. Munfordville and Woodsonville, Ky., September 14-17 (Co. “I”). Garrison at Clarksville, Tenn., December, 1862, to August, 1863. Regiment mounted and engaged in scouting about Clarksville with many skirmishes. Ordered to Columbia August 25. Scouting and outpost duty on flanks of the army and about Chattanooga till January, 1864. Action at Railroad Tunnel, near Cowan, October 9, 1863 (Detachment). Reconnoissance toward Dalton, Ga., January 21-23, 1864. Near Dalton January 22. Picketing roads south of Chattanooga toward Lafayette, Resaca and Dalton, Ga., till March. Demonstration on Dalton, Ga., February 22-27. Rocky Faced Ridge and Buzzard’s Roost Gap February 23-25. At Pulaski, Tenn., till April. At Lee and Gordon’s Mills till April 20. Dismounted April 20 and joined 4th Army Corps. Atlanta (Ga.) Campaign May 1 to September 8. Demonstrations on Rocky Faced Ridge and Dalton May 8-13. Buzzard’s Roost Gap May 8-9. Battle of Resaca May 14-15. Adairsville May 17. Near Kingston May 18-19. Near Cassville May 19. Advance on Dallas May 22-25. Operations on line of Pumpkin Vine Creek and battles about Dallas, New Hope Church and Allatoona Hills May 25-June 5. Operations about Marietta and against Kenesaw Mountain June 10-July 2. Pine Hill June 11-14. Lost Mountain June 15-17. Assault on Kenesaw June 27. Ruff’s Station or Smyrna Camp Ground July 4. Chattahoochie River July 5-17. Buckhead or Nancy’s Creek July 18. Peach Tree Creek July 19-20. Siege of Atlanta July 22-August 25. Flank movement on Jonesboro August 25-30. Battle of Jonesboro August 31-September l. Lovejoy Station September 2-6. Operations against Hood in North Georgia and North Alabama September 29-November 3. Nashville Campaign November-December. In front of Columbia November 24-27. Spring Hill November 29. Battle of Franklin November 30. Battle of Nashville December 15-16. Pursuit of Hood to the Tennessee River December 17-28. Moved to Huntsville, Ala., and duty there till March, 1865. Expedition to Bull’s Gap and operations in East Tennessee March 15-April 22. Moved to Nashville, Tenn., and duty there till June. Moved to New Orleans, La., thence to Texas June and July. Duty at San Antonio and Victoria till December. Mustered out December 14, 1865.Regiment lost during service 1 Officer and 36 Enlisted men killed and mortally wounded and 1 Officer and 74 Enlisted men by disease. Total 112. Name in USG Records: Floore, John M.
6th Regiment, Kentucky Mounted Infantry Overview: 6th Infantry Regiment was organized at Cave City, Kentucky, in November, 1861, and included in Cofer’s 1st Kentucky Infantry Battalion. Its members were raised in the counties of Nelson, Spencer, Hardin, Franklin, Barren, Green, Allen, Anderson, Bullitt, and Simpson. It became part of the Orphan Brigade or Louisville Legion. This regiment lost 108 killed and wounded at Shiloh, sustained 18 casualties at Baton Rouge, then was active at Vicksburg. During the war it was assigned to General Hanson’s, Helm’s, and J.H. Lewis’ Brigade. It fought with distinction at Murfreesboro and Chickamauga, then saw action in the Atlanta Campaign. In the fall of 1864 the unit was mounted, and aided in the defense of Savannah and the campaign of the Carolinas. It lost seventeen percent of the 269 engaged at Murfreesboro and 220 saw action at Chickamauga. The unit totalled 263 men and 221 arms in December, 1863. The 6th surrendered with the Army of Tennessee on April 26, 1865. The field officers were Colonels Martin H. Cofer and Joseph H. Lewis, Lieutenant Colonel William L. Clarke, and Majors Thomas H. Hays and George W. Maxson. 7th Regiment, Kentucky Cavalry Overview: Organized at large and mustered in at Paris, Ky., August 16, 1862. Attached to Army of Kentucky, unassigned, Dept. of Ohio, to November, 1862. District of Central Kentucky, Dept. Ohio, to March, 1863. 1st Brigade, 1st Division, Cavalry Corps, Army of the Cumberland, to July, 1863. 3rd Brigade, 1st Division, Cavalry Corps, Army of the Cumberland, to November, 1864. 3rd Brigade, 1st Division, Cavalry Corps, Military Division Mississippi, to January, 1865. 2nd Brigade, 1st Division, Cavalry Corps, M. D. M., to July, 1865. SERVICE- Before muster participated in operations against Morgan July 4-28, 1862. Cynthiana, Ky., July 17 (Detachment). Paris July 19. Big Hill, Madison County, August 23. Richmond August 30. Moved to Tennessee December, 1862. Hartsville December 7. Scouting at Castillian Springs till March, 1863. Moved to Franklin, Tenn. Expedition from Franklin to Columbia March 8-12. Thompson’s Station March 9. Rutherford Creek March 10-11. Spring Hill March 18-19. Columbia Pike April 1. Thompson’s Station May 2. Moved to Triune June 2-4. Franklin June 4. Middle Tennessee or Tullahoma Campaign June 23-July 7. Expedition to Huntsville July 13-22. Detached at Bridgeport, Caperton’s Ferry and Nashville till December. Operations about Mossy Creek and Dandridge, Tenn., December 24-28. Mossy Creek Station December 24. Peck’s House, near New Market, December 24. Mossy Creek December 26. Talbot’s Station December 26-28. Mossy Creek December 29. Moved to Morristown. Kimbrough’ Cross Roads and bend of Chucky River January 16, 1864. Operations about Dandridge January 16-17. Dandridge January 17. Pigeon River, near Fair Garden, January 27. Swann’s Bridge, Paris Ford. January 28. At Cleveland, Tenn., till May. Atlanta (Ga.) Campaign May to September. Guarding railroad in rear of army, at Wauhatchie, Tenn., May 5 to June 18. At Lee and Gordon’s Mills and Lafayette till August 4. Action at Lafayette June 24. Actions at Lost Mountain July 1-2. At Calhoun and Dalton till October 12. Pine Log Creek and near Fairmount August 14. Dalton August 14-15 (Co. “B”). Rousseau’s pursuit of Wheeler September 1-8. Resaca October 12-13. Surrender of Dalton October 13 (Co. “B”). Near Summerville October 18. Little River, Ala., October 20. Leesburg October 21. Ladiga, Terrapin Creek, October 28 (Detachment). Moved to Louisville, Ky., November 3-9. McCook’s pursuit of Lyon December 6-28. Hopkinsville, Ky., December 16. At Nashville, Tenn., till January 9, 1865. Moved to Gravelly Springs, Ala., and duty there and at Waterloo till March. Wilson’s Raid from Chickasaw, Ala., to Macon, Ga., March 22-April 24. Selma April 2. Montgomery April 12. Columbus Road, near Tuskegee, April 14. Fort Tyler, West Point, April 16. Capture of Macon April 20. Duty at Macon till June and at Nashville, Tenn., till July. Mustered out July 10, 1865.Regiment lost during service 2 Officers and 22 Enlisted men killed and mortally wounded and 5 Officers and 118 Enlisted men by disease. Total 147. 18th Regiment, Kentucky Infantry Overview: Organized at large and mustered in February 8, 1862. Served unattached, Army of Ohio, to August, 1862. Cruft’s Brigade, Nelson’s Division, Richmond, Ky., Army of Kentucky, to September, 1862. 1st Brigade, 2nd Division, Army of Kentucky, Dept. of Ohio, to October, 1862. Unattached, Army of Kentucky, Dept. of Ohio, to December, 1862. 1st Brigade, 2nd Division, Army of Kentucky, to February, 1863. Crook’s Brigade, Baird’s Division, Army of Kentucky, Dept. of the Cumberland, to June, 1863. 3rd Brigade, 4th Division, 14th Army Corps, Army of the Cumberland, to October, 1863. 3rd Brigade, 3rd Division, 14th Army Corps, to June, 1865. 1st Brigade, 3rd Division, 14th Army Corps, to July, 1865. Service: Duty guarding Covington & Lexington Railroad. Headquarters at Falmouth, Ky., till April 16, 1862, and at Lexington, Ky., till August 20, 1862. Affairs in Owen County June 20 and 23. Operations in Kentucky against Morgan July 4-28. Action at Cynthiana July 17. Paris July 19. Mt. Sterling, Ky., July 29. Moved to Richmond, Ky., August 20. Battle of Richmond, Ky., August 30. Regiment mostly captured; those not captured retreat to Louisville, Ky.; thence moved to Covington, Ky., September 28; thence to Paris, Ky., and duty there till December 5. Moved to Lexington, Ky., December 5; thence to Louisville, Ky., January 27, 1863, and to Nashville, Tenn., February 2. Moved to Carthage and duty there till June 2. Moved to Murfreesboro, Tenn., June 2-7. Middle Tennessee (or Tullahoma) Campaign June 23-July 7. Hoover’s Gap June 24-26. Occupation of Tullahoma July 1. Occupation of Middle Tennessee till August 16. Passage of Cumberland Mountains and Tennessee River and Chickamauga (Ga.) Campaign August 16-September 22. Catlett’s Gap, Pigeon Mountain, September 15-18. Battle of Chickamauga September 19-21. Rossville Gap September 21. Siege of Chattanooga, Tenn., September 22-November 23. Reopening Tennessee River October 26-29. Brown’s Ferry October 27. Chattanooga-Ringgold Campaign November 23-27. Orchard Knob November 23-24. Mission Ridge November 25. Duty at Chattanooga till January, 1864. Regiment Veteranize January 5, and Veterans on leave till March. Moved to Nashville, Tenn., March 12; thence march to Ringgold, Ga., March 22-May 7. Atlanta (Ga.) Campaign May to September. Assigned May 10 to post duty at Ringgold, Ga. Relieved September 25 and moved to Atlanta, Ga. Operations against Hood in North Georgia and North Alabama October 3-26. March to the sea November 10. Siege of Savannah December 10-21. Campaign of the Carolinas January to April, 1865. Fayetteville, N. C., March 11. Battle of Bentonville, N. C., March 19-21. Occupation of Goldsboro March 24. Non-Veterans mustered out April 4, 1865. Advance on Raleigh, N. C., April 10-14. Occupation of Raleigh April 14. Bennett’s House April 26. Surrender of Johnston and his army. March to Washington, D. C., via Richmond, Va., April 29-May 30. Grand Review May 24. Moved to Louisville, Ky., June. Mustered out July 18, 1865.Regiment lost during service 5 Officers and 85 Enlisted men killed and mortally wounded and 1 Officer and 152 Enlisted men by disease. Total 243. John was born in 1831 in Warren County, Kentucky and was the son of George Flora (1786-1858) and Permelia Rhodes ( ? – 1848). [George was born in Virginia, a son of Nicholas Adolph Flohri from that immigrant ancestor’s first marriage]. He was mustered into service at Franklin, Simpson County, Kentucky on the 3rd March 1864 into Co. “H”, 52nd Kentucky Volunteer Mounted Infantry for one year. He was mustered out of the Army on 11th March 1865 at Bowling Green, Warren County, Kentucky. He died in 1912. 52nd Regiment, Kentucky Infantry Overview: Organized at Franklin and Scottsville, Ky. Companies “A,” “B,” “C” and “E” mustered in at Scottsville October 16, 1863; Company “D” October 17, 1863; Company “F” November 12, 1863, and Company “G” December 21, 1863. Companies “H,” “I” and “K” mustered in at Franklin March 3, 1864. Attached to 3rd Brigade, 1st Division, District of Kentucky, Dept. Ohio, to July, 1864. 2nd Brigade, 2nd Division, District of Kentucky, Dept. Ohio, to October, 1864. 1st Brigade, 2nd Division, District of Kentucky, 5th Division, 23rd Army Corps, Dept. Ohio, to January, 1865. Service: Operations against guerrillas in Southern and Central Kentucky, guarding and protecting public property, and protecting lines of communication with the army operating at the front till March, 1864. Operations against Forest’s Raid into Kentucky March 23-April 19, and against Morgan in Eastern Kentucky May 31-June 20. Action at New Hope March 28. Mt. Sterling June 9. Cynthiana June 12. Operations in Western Kentucky July-August. Action at Bell Mines July 13. Operations in Webster and Union counties July 14-18. Morganfield July 14. Geiger’s Lake July 15. Operations against Adam Johnson about Uniontown August. Grubb’s Cross Roads August 21. Canton and Roaring Springs August 22. Moved to Lexington August 27, thence to Bowling Green August 30, and to Nashville, Tenn. Scottsville December 8 (1 Co.). Mustered out January 17, 1865.Regiment lost during service 1 Officer and 10 Enlisted men killed and mortally wounded and 48 Enlisted men by disease. Total 59. 10th Regiment, Kentucky Infantry Overview: Organized at Lebanon, Ky., November 21, 1861. Attached to 2nd Brigade, Army of Ohio, to December, 1861. 2nd Brigade, 1st Division, Army of Ohio, to September, 1862. 2nd Brigade, 1st Division, 3rd Corps, Army of Ohio, to November, 1862. 2nd Brigade, 3rd Division (Centre), 14th Army Corps, Army of the Cumberland, to January, 1863. 2nd Brigade, 3rd Division, 14th Army Corps, to October, 1863. 3rd Brigade, 3rd Division, 14th Army Corps, to December, 1864. Service: Advance on Camp Hamilton, Ky., January 1-15, 1862. Action at Logan’s Cross Roads on Fishing Creek January 19. Battle of Mill Springs January 19-20. Duty at Mill Springs till February 11. Moved to Louisville, thence to Nashville, Tenn., February 11-March 2. March to Savannah, Tenn., March 20-April 7. Expedition to Bear Creek, Ala., April 12-13. Advance on and siege of Corinth, Miss., April 29-May 30. Buell’s Campaign in Northern Alabama and Middle Tennessee June to August. Courtland Bridge July 25 (Cos. “A” and “H”). Decatur August 7. March to Nashville, Tenn., thence to Louisville, Ky., in pursuit of Bragg August 20-September 26. Pursuit of Bragg into Kentucky October 1-16. Battle of Perryville, Ky., October 8. March to Gallatin, Tenn., and duty there till January 13, 1863. Operations against Morgan December 22, 1862, to January 2, 1863. Moved to Nashville, Tenn., January 13, 1863; thence to Murfreesboro and duty there till June. Expedition toward Columbia March 4-14. Middle Tennessee (or Tullahoma) Campaign June 23-July 7. Hoover’s Gap June 24-26. Occupation of Middle Tennessee till August 16. Passage of Cumberland Mountains and Tennessee River and Chickamauga (Ga.) Campaign August 16-September 22. Battle of Chickamauga September 19-21. Before Chattanooga September 22-26. Siege of Chattanooga September 26-November 23. Chattanooga-Ringgold Campaign November 23-27. Orchard Knob November 23-24. Mission Ridge November 25. Reconnoissance of Dalton, Ga., February 22-27, 1864. Tunnel Hill, Buzzard’s Roost Gap and Rocky Faced Ridge February 23-25. Atlanta (Ga.) Campaign May 1-September 8. Demonstration on Rocky Faced Ridge and Dalton May 8-13. Buzzard’s Roost Gap May 8-9. Battle of Resaca May 14-15. Advance on Dallas May 18-25. Operations on line of Pumpkin Vine Creek and battles about Dallas, New Hope Church and Allatoona Hills May 25-June 5. Operations about Marietta and against Kenesaw Mountain June 10-July 2. Pine Hill June 11-14. Lost Mountain June 15-17. Near Marietta June 19. Assault on Kenesaw June 27. Ruff’s Station July 4. Chattahoochie River July 5-17. Vining Station July 9-11. Peach Tree Creek July 19-20. Siege of Atlanta July 22-August 25. Flank movement on Jonesboro August 25-30. Battle of Jonesboro August 31-September 1. Moved to Ringgold, Ga., thence to Chattanooga, Tenn., and duty there till November. Ordered to Kentucky November 14. Mustered out December 6, 1864.Regiment lost during service 2 Officers and 70 Enlisted men killed and mortally wounded and 5 Officers and 144 Enlisted men by disease. Total 221. 23rd Regiment, Kentucky Infantry Overview: Organized at Camp King, Lexington, Ky., and mustered in January 2, 1862. Attached to District of Kentucky, Dept. of the Ohio, to March, 1862. 23rd Independent Brigade, Army of the Ohio, to July, 1862. 10th Brigade, 4th Division, Army of the Ohio, to September, 1862. 10th Brigade, 4th Division, 2nd Corps, Army of the Ohio, to November, 1862. 3rd Brigade, 2nd Division, Left Wing 14th Army Corps, Army of the Cumberland, to January 1863. 3rd Brigade, 2nd Division, 21st Army Corps, Army of the Cumberland, to October, 1863. 2nd Brigade, 3rd Division, 4th Army Corps, to August, 1864. 2nd Brigade, 1st Division, 4th Army Corps, to June, 1865. 1st Brigade, 1st Division, 4th Army Corps, to August, 1865. Dept. of Texas to December, 1865. Service: Garrison and guard duty in Southern Kentucky and Middle Tennessee January to August, 1862. Round Mountain, near Woodbury, Tenn., August 27. March to Louisville, Ky., in pursuit of Bragg, September 1-26. Pursuit of Bragg into Kentucky October 1-16. Battle of Perryville October 8 (Reserve). March to Nashville, Tenn., October 17-November 7, and duty there till December 26. Advance on Murfreesboro December 26-30. Lavergne December 27. Battle of Stone’s River December 30-31, 1862, and January 1-3, 1865. Woodbury January 24. At Murfreesboro till June. Scout from Clarksville May 20-22. Middle Tennessee (or Tullahoma) Campaign June 23-July 7. At Manchester till August 16. Passage of Cumberland Mountains and Tennessee River and Chickamauga (Ga.) Campaign August 16-September 22. Ringgold September 11. Lee and Gordon’s Mills September 12-13. Battle of Chickamauga September 19-20. Siege of Chattanooga, Tenn., September 24-November 23. Reopening Tennessee River October 26-29. Brown’s Ferry October 27. Chattanooga-Ringgold Campaign November 23-27. Orchard Knob November 23-24. Mission Ridge November 25. Pursuit to Graysville November 26-27. March to relief of Knoxville November 28-December 8. Charlestown December 28. Operations in East Tennessee December, 1863, to April, 1864. Regiment Veteranize at Blain’s Cross Roads, Tenn., January 5, 1864. Atlanta (Ga.) Campaign May 1 to September 8, 1864. Demonstrations on Rocky Faced Ridge and Dalton, Ga., May 5-13. Battle of Resaca May 14-15. Adairsville May 17. Near Kingston May 18-19. Near Cassville May 19. Operations on line of Pumpkin Vine Creek and battles about Dallas, New Hope Church and Allatoona Hills May 25-June 5. Pickett’s Mill May 27. Operations about Marietta and against Kenesaw Mountain June 10-July 2. Pine Hill June 11-14. Lost Mountain June 15-17. Assault on Kenesaw June 27. Ruff’s Station, Smyrna Camp Ground, July 4. Pace’s Ferry July 5. Chattahoochie River July 6-17. Peach Tree Creek July 19-20. Siege of Atlanta July 22-August 25. Utoy Creek August 5-7. Flank movement on Jonesboro August 25-30. Battle of Jonesboro August 31-September 1. Lovejoy Station September 2-6. Operations against Hood in North Georgia and North Alabama October 1-26. Nashville Campaign November-December. Columbia, Duck River, November 24-27. Battle of Franklin November 30. Battle of Nashville December 15-16. Pursuit of Hood to the Tennessee River December 17-29. Moved to Huntsville, Ala., and duty there till March, 1865. Expedition to Bull’s Gap and operations in East Tennessee March 15-April 22. At Nashville, Tenn., till June. Ordered to New Orleans, La., June 6; thence moved to Texas July. Duty at Indianola, Green Lake and Victoria till December. Mustered out December 27, 1865.Regiment lost during service 5 Officers and 84 Enlisted men killed and mortally wounded and 102 Enlisted men by disease. Total 191. William was born to John W and Isabel Flora in Kentucky. At age 19 in 1863 he enlisted in the 51st KY Infantry (Union) the regiment not being able to be completed he was transferred to Co H 37th KY Mounted Infantry. William was promoted corporal. The regiment was sent to Cynthiana [Harrison County] and Glasgow [Barren County] Kentucky, and was active along the Kentucky-Virginia border. The main action was a battle at Saltville, Virginia. William was detailed as the color bearer of the regiment. In 1864 he was discharged and returned home. William B Flora wrote a Personal war sketch for his GAR [Grand Army of the Republic] Post in Paxton Illinois (he served as the Vice Commander of that post) in which he listed the regiment’s main activity [during the war] as patrolling against raids from Confederate “bushwhackers” (the Confederate raiders Morgan, Forrest and others were active in Kentucky [during the war]. His one major battle was the Battle of Saltville, in the western panhandle of Virginia. It was the Confederacy’s principal salt works and several mounted Union infantry regiments (including U.S. Colored units) rode from Kentucky and Ohio to try to take it out. They were defeated, and many of the wounded and captured Colored Troops were massacred. He went out to Oklahoma after the war. He was tough and served in a regiment which suffered many casualties. 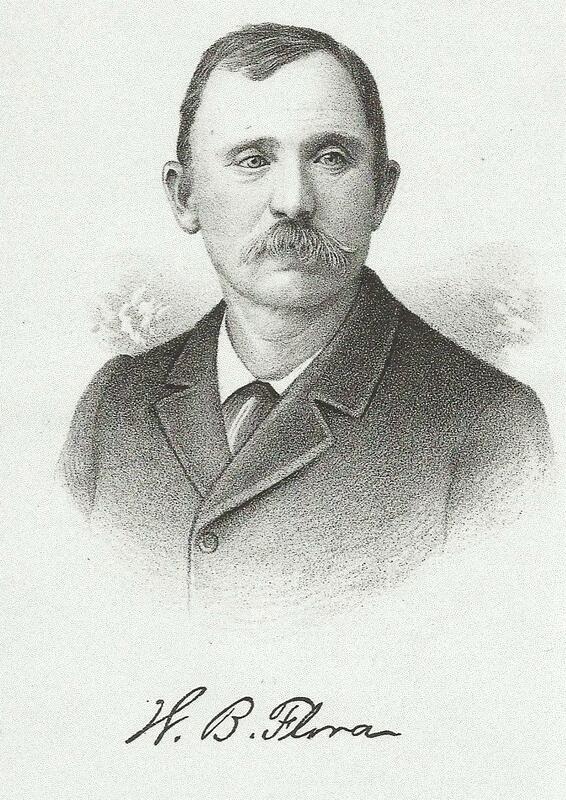 William Flora lived long enough to ride in the Oklahoma land rush in 1889. 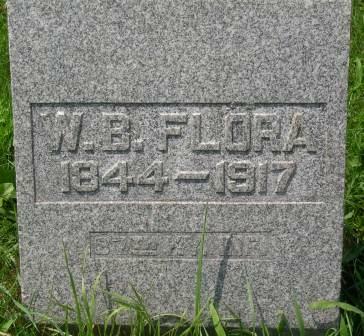 Gravestone of William B. Flora, 37th Kentucky Infantry in Paxton, Illinois. 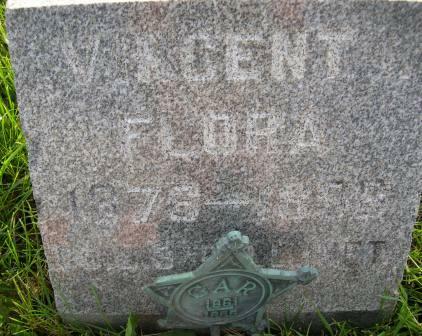 In a related rather melancholic story, Vincent Flora (son of William B Flora) enlisted at age 22 in 1898 in Co L of the 3rd Illinois Infantry in Kankakee, Illinois (for the brief Spanish-American War?). While the Regiment was in Chattanooga, Tennessee Vincent became sick. Doctors originally diagnosed typhoid, but it was really pneumonia. William and Mary went to see him and were with Vincent in Chattanooga when he died. They brought his body back to Paxton, Illinois where Vincent’s funeral was one of the largest ever seen in the town. 37th Regiment, Kentucky Infantry Overview: Organized at Glasgow, Ky., September 17 to December 22, 1863. Attached to District of South Central Kentucky, 1st Division, 23rd Army Corps, Dept. of Ohio, to January, 1864. District of Southwest Kentucky, 1st Division, 23rd Army Corps, to April, 1864. 3rd Brigade, 1st Division, District of Kentucky, 5th Division, 23rd Army Corps, Dept. of Ohio, to December, 1864. Service: Duty at Glasgow, Ky., and in District of South Central Kentucky, operating against guerrillas and protecting public property till March, 1864. Attack on Camp at Glasgow October 6, 1863. Moved to Columbia March, 1864. Operations against Morgan May 31-June 20. Mt. Sterling, Ky., June 9. Cynthiana June 12. Operations in Eastern Kentucky till September. Bettier’s Gap August 23. Burbridge’s Expedition into Southwest Virginia September 20-October 17. McCormick’s Gap September 20. Saltsville, Va., October 2. Bloomfield November 5. Owen County November 15. Mustered out December 29, 1864.Regiment lost during service 8 Enlisted men killed and mortally wounded and 98 Enlisted men by disease. Total 106. 12th Regiment, Kentucky Cavalry Overview: Organized at Caseyville and Owensboro, Ky., November 17, 1862. Attached to District of West Kentucky, Dept. Ohio, to June, 1863. 2nd Brigade, 3rd Division, 23rd Army Corps, Army of the Ohio, to August, 1863. Independent Cavalry Brigade, 23rd Army Corps, to November, 1863. 1st Brigade, 1st Division, Cavalry Corps, Dept. Ohio, to April, 1864. 3rd Brigade, Cavalry Division, District Kentucky, Dept. Ohio, May, 1864. 1st Brigade, Cavalry Division, 23rd Army Corps, to June, 1864. Detached Cavalry Brigade, 3rd Division, 23rd Army Corps, to August, 1864. Dismounted Brigade, Cavalry Division, 23rd Army Corps, to September, 1864. 1st Brigade, Cavalry Division, 23rd Army Corps, September, 1864. District of Louisville, Ky., to November, 1864. 2nd Brigade, 4th Division, 23rd Army Corps, to March, 1865. 2nd Brigade, Cavalry Division, District East Tennessee, to July, 1865. Cavalry Brigade, District East Tennessee, to August, 1865. Service: Action at Owensboro, Ky., September 18, 1862. Sutherland Farm September 19. Action at Calhoun, Ky., November 25, 1862. Operations against Morgan’s Raid into Kentucky December 22, 1862, to January 2, 1863. Bear Wallow, Ky., December 23, 1862. Near Glasgow December 24. Bear Wallow and near Munfordsville December 25. Bacon Creek near Munfordsville December 26. Johnson’s Ferry, Hamilton’s Ford, Rolling Fork, December 29. Boston, Ky., December 29. Duty in District of Western Kentucky till April, 1863. Creelsborough April 19. Expedition to Monticello and operations in Southeastern Kentucky April 26-May 12. Narrows, Horse Shoe Bottom, April 28-29. Horse Shoe Bend, Greasy Creek, May 10. Pursuit of Morgan through Kentucky, Indiana and Ohio July 2-26. Marrowbone July 2. Buffington’s Island, Ohio, July 19. Surrender of Morgan near Cheshire, Ohio, July 20. New Lisbon, Ohio, July 26. Ordered to Glasgow, Ky., August 4. Burnside’s march into East Tennessee August 16-October 17. Operations about Cumberland Gap September 7-10. Carter’s Station September 20-21. Jonesboro September 21. Watauga River Bridge September 21-22. Philadelphia October 20. Knoxville Campaign November 4-December 23. Little River November 14-15. Stock Creek November 15. Near Knoxville November 16. Siege of Knoxville November 17-December 4. Clinch Mountain December 6. Rutledge December 7. Bean’s Station December 9-17. Rutledge December 16. Blain’s Cross Roads December 16-19. Bean’s Station and Rutledge December 18. Bend of Chucky Road near Dandridge January 16-17. About Dandridge January 16-17. Dandridge January 17. About Dandridge January 26-28. Flat Creek and Muddy Creek January 26. Fair Garden January 27. Dandridge January 28. Moved to Lebanon, Ky., February 3-12. At Mt. Sterling till April. March from Nicholsville, Ky., to Dalton, Ga., April 29-May 11. Atlanta (Ga.) Campaign May 11-September 8. Vernell Station May 11. Battle of Resaca May 14-15. Pine Log Creek May 18. Cassville May 19-22. Eutaw River May 20. About Dallas May 25-June 5. Burned Church May 26-27. Mt. Zion Church May 27-28. Allatoona May 30. Pine Mountain June 10. Operations about Marietta and against Kenesaw Mountain June 10-July 2. Lost Mountain June 11-17. Muddy Creek June 17. Noyes Creek June 19. McAffee’s Cross Roads June 20. Cheyney’s Farm June 22. Olley’s Cross Roads June 26-27. Assault on Kenesaw June 27. Lost Mountain July 1-2. Nickajack Creek July 2-5. Chattahoochie River July 6-17. Siege of Atlanta July 22-August 25. Flank movement on Jonesboro August 25-30. Battle of Jonesboro August 31-September 1. Ordered to Louisville, Ky., September 14. Duty there at Lexington and Camp Nelson, Ky., till November. Rally Hill November 29. Burbridge’s Saltsville Expedition December 10-29. Kingsport December 13. Bristol December 14. Near Glade Springs December 15. Marion and capture of Wytheville, Va., December 16. Mt. Airey December 17. Near Marion December 17-18. Capture and destruction of Salt works at Saltsville, Va., December 20-21. Operations against Sue Monday’s guerrillas near Elizabethtown, Ky., and in Green River Counties January and February, 1865. Moved to Knoxville, Tenn., March 20 and join General Stoneman. Stoneman’s Raid in Southwest Virginia and Western North Carolina March 20-April 27. Boone, N. C., March 28. Statesville April 10-11. Shallow Ford and near Mocksville April 11. Grant’s Creek and Salisbury April 12. Catawba River near Morgantown April 17. Howard’s Gap, Blue Ridge Mountains, April 22. Near Hendersonville April 23. Asheville April 25. Return to East Tennessee and duty at Sweetwater till August. Mustered out August 23, 1865.Regiment lost during service 3 Officers and 22 Enlisted men killed and mortally wounded and 4 Officers and 204 Enlisted men by disease. Total 233. 6th Regiment, Kentucky Cavalry Overview: Organized in Central Kentucky July to October, 1862. Munday’s 1st Battalion Cavalry assigned as Companies “A,” “B,” “C,” “D” and “E.” Attached to District of Central Kentucky to October, 1862. District of Louisville, Ky., Dept. Ohio, to November, 1862. District Central Kentucky, Dept. Ohio, to January, 1863. 1st Brigade, 1st Division Cavalry, Army of the Cumberland, to July, 1863. 3rd Brigade, 1st Division, Cavalry Corps, Army of the Cumberland, to November, 1864. 3rd Brigade, 1st Division, Cavalry Corps, Military Division Mississippi, to January, 1865. 1st Brigade, 1st Division, Cavalry Corps, Middle Division Mississippi, and District of Middle Tennessee, Dept. of the Cumberland, to September, 1865. Service: Skirmish Flat Lick August 17 (Detachment). Skirmish at Slaughterville, Ky., September 3, 1862 (Detachment) Mumfordsville September 20-21 (Detachment). Pursuit of Bragg through Kentucky October 1-22. 1st Battalion to Litchfield and skirmish with Bragg. 2nd Battalion to Bardstown and skirmish with Wheeler. 3rd Battalion to Stanford. 1st Battalion ordered to Louisa, Ky., November 14, thence to Mt. Sterling, Ky., December 9. Regiment concentrated at Lebanon, Ky., December, 1862. Operations against Morgan December 22, 1862, to January 2, 1863. Near Huntington December 27. Parker’s Mills on Elk Fork December 28. Affair Springfield December 30 (Detachment). Muldraugh’s Hill near New Market December 31. Ordered to Nashville, Tenn., January 30, thence to Franklin, Tenn., and duty there till June. Expedition from Franklin to Columbia March 8-12. Thompson’s Station March 9. Rutherford Creek March 10-11. Near Thompson’s Station March 23. Little Harpeth River March 25. Near Franklin March 31. Franklin April 27. Thompson’s Station May 2. Moved to Triune June 2-4. Franklin June 4. Triune June 9. Middle Tennessee or Tullahoma Campaign June 23-July 7. University Depot July 4. Expedition to Huntsville July 13-22. Expedition to Athens, Ala., August 2-8. Passage of Cumberland Mountains and Tennessee River and Chickamauga (Ga.) Campaign August 16-September 22. Alpine, Ga., September 5. Summerville September 6-7 and 10. Battle of Chickamauga September 19-21. Buell’s Ford September 28. Operations against Wheeler and Roddy September 30-October 17. At Caperton’s Ferry till January, 1864. Lafayette, Ga., December 12, 1863. Ringgold December 13. Scout to Lafayette December 21-23. Regiment veteranize January, 1864, and Veterans on furlough till March. Near Chattanooga, Tenn., till May. Atlanta (Ga.) Campaign May to September. Guarding railroad in rear of the army at Wauhatchie, Lafayette, Calhoun, Dalton and Resaca. At Wauhatchie, Tenn., May 5 to June 18. At Lafayette, Ga., June 18 to August 4. Summerville July 7. Actions at Lafayette June 24 and 30. Scouting about Calhoun, Adairsville and Resaca till October 12. Pine Log Creek near Fairmount August 14. Rousseau’s pursuit of Wheeler September 1-8. Resaca October 12-13. Near Summerville October 18. Little River, Ala., October 20. Leesburg October 21. Ladiga, Terrapin Creek, October 28. Moved to Louisville, Ky., November 3-9. McCook’s pursuit of Lyon December 6-28. Hopkinsville, Ky., December 16. At Nashville, Tenn., till January 9. Moved to Gravelly Springs, Ala., and duty there till March. Wilson’s Raid from Chickasaw, Ala., to Macon, Ga., March 22-April 24. Centerville April 1. Trion April 1. Selma April 2. Northport near Tuscaloosa April 4. Lapier’s Mills, Sipsey Creek, April 6. King’s Store April 6 (Co. “D”). Occupation of Talladega April 22. Munford’s Station April 23. At Macon till June. Moved to Nashville, Tenn., and duty in District of Middle Tennessee till September. Non-Veterans mustered out at Edgefield July 14, 1865. Regiment mustered out September 6, 1865.Regiment lost during service 2 Officers and 31 Enlisted men killed and mortally wounded and 4 Officers and 251 Enlisted men by disease. Total 288.7th Regiment, Kentucky Cavalry Overview: Organized at large and mustered in at Paris, Ky., August 16, 1862. Attached to Army of Kentucky, unassigned, Dept. of Ohio, to November, 1862. District of Central Kentucky, Dept. Ohio, to March, 1863. 1st Brigade, 1st Division, Cavalry Corps, Army of the Cumberland, to July, 1863. 3rd Brigade, 1st Division, Cavalry Corps, Army of the Cumberland, to November, 1864. 3rd Brigade, 1st Division, Cavalry Corps, Military Division Mississippi, to January, 1865. 2nd Brigade, 1st Division, Cavalry Corps, M. D. M., to July, 1865. SERVICE-Before muster participated in operations against Morgan July 4-28, 1862. Cynthiana, Ky., July 17 (Detachment). Paris July 19. Big Hill, Madison County, August 23. Richmond August 30. Moved to Tennessee December, 1862. Hartsville December 7. Scouting at Castillian Springs till March, 1863. Moved to Franklin, Tenn. Expedition from Franklin to Columbia March 8-12. Thompson’s Station March 9. Rutherford Creek March 10-11. Spring Hill March 18-19. Columbia Pike April 1. Thompson’s Station May 2. Moved to Triune June 2-4. Franklin June 4. Middle Tennessee or Tullahoma Campaign June 23-July 7. Expedition to Huntsville July 13-22. Detached at Bridgeport, Caperton’s Ferry and Nashville till December. Operations about Mossy Creek and Dandridge, Tenn., December 24-28. Mossy Creek Station December 24. Peck’s House, near New Market, December 24. Mossy Creek December 26. Talbot’s Station December 26-28. Mossy Creek December 29. Moved to Morristown. Kimbrough’ Cross Roads and bend of Chucky River January 16, 1864. Operations about Dandridge January 16-17. Dandridge January 17. Pigeon River, near Fair Garden, January 27. Swann’s Bridge, Paris Ford. January 28. At Cleveland, Tenn., till May. Atlanta (Ga.) Campaign May to September. Guarding railroad in rear of army, at Wauhatchie, Tenn., May 5 to June 18. At Lee and Gordon’s Mills and Lafayette till August 4. Action at Lafayette June 24. Actions at Lost Mountain July 1-2. At Calhoun and Dalton till October 12. Pine Log Creek and near Fairmount August 14. Dalton August 14-15 (Co. “B”). Rousseau’s pursuit of Wheeler September 1-8. Resaca October 12-13. Surrender of Dalton October 13 (Co. “B”). Near Summerville October 18. Little River, Ala., October 20. Leesburg October 21. Ladiga, Terrapin Creek, October 28 (Detachment). Moved to Louisville, Ky., November 3-9. McCook’s pursuit of Lyon December 6-28. Hopkinsville, Ky., December 16. At Nashville, Tenn., till January 9, 1865. Moved to Gravelly Springs, Ala., and duty there and at Waterloo till March. Wilson’s Raid from Chickasaw, Ala., to Macon, Ga., March 22-April 24. Selma April 2. Montgomery April 12. Columbus Road, near Tuskegee, April 14. Fort Tyler, West Point, April 16. Capture of Macon April 20. Duty at Macon till June and at Nashville, Tenn., till July. Mustered out July 10, 1865.Regiment lost during service 2 Officers and 22 Enlisted men killed and mortally wounded and 5 Officers and 118 Enlisted men by disease. Total 147. 11th Regiment, Kentucky Cavalry Overview: Companies “A,” “C,” “D” and “F” organized at Harrodsburg, Ky., July, 1862. Balance at Louisville, Ky., September 26, 1862. Attached to District of Western Kentucky, Dept. Ohio, to June, 1863. 2nd Brigade, 3rd Division, 23rd Army Corps, Dept. Ohio, to August, 1863. Independent Cavalry Brigade, 23rd Army Corps, to November, 1863. 1st Brigade, 1st Division, Cavalry Corps, Army Ohio, to April, 1864. 3rd Brigade, Cavalry Division, District Kentucky, Dept. Ohio, to May, 1864. Independent Brigade, Cavalry Division, 23rd Army Corps, to September, 1864. Military District Kentucky, Dept. Ohio to March, 1865. 2nd Brigade, Cavalry Division, District of East Tennessee, Dept. of the Cumberland, to July, 1865. Service: Companies “A,” “C,” “D” and “F” moved to Frankfort, Ky., July 22, 1862, thence to Louisville, Ky., and join Regiment. Regiment moved to Frankfort, Ky., November, 1862. Duty there and at Bowling Green, Scottsville and Gallatin, Tenn., till December 25, 1862. Hartsville, Tenn., December 7 (Co. “E”). Moved to Glasgow, Ky., December 25, and duty there and at various points in Western Kentucky till August, 1863. Action at Creelsburg, Ky., April 19. Expedition to Monticello and operations in Southeast Kentucky April 26-May 12. Scottsville June 11. Pursuit of Morgan July 2-26. Buffington Island, Ohio, July 19. New Lisbon, Ohio, July 26. Burnside’s Campaign in East Tennessee August 16-October 17. Calhoun and Charleston September 25. Philadelphia October 20. Knoxville Campaign November 4-December 23. Marysville November 14. Little River November 14-15. Stock Creek November 15. Near London November 15. Near Knoxville November 16. Siege of Knoxville November 17-December 5. About Bean’s Station December 9-13. Operations about Dandridge January 16-17, 1864. Bend of Chucky Road near Dandridge January 16. Dandridge January 17. Flat and Muddy Creeks January 26. Near Fair Garden January 27. French Broad January 28. Moved to Mt. Sterling, Ky., February 3-12, and duty there till April. March from Nicholasville, Ky., to Dalton, Ga., April 29-May 11. Atlanta (Ga.) Campaign May to August. Varnell Station May 11. Demonstration on Dalton May 11-13. Battle of Resaca May 14-15. Operations on line Pumpkin Vine Creek and battles about Dallas, New Hope Church and Allatoona Hills May 25-June 5. Burnt Church May 26-27. Mt. Zion Church May 27-28. Allatoona May 30. Operations about Marietta and against Kenesaw Mountain June 10-July 2. Pine Hill June 11-14. Lost Mountain June 15-17. Muddy Creek June 17. Noyes Creek June 19. Cheyney’s Farm June 22. Olley’s Creek June 26-27. Assault on Kenesaw June 27. On line of Nickajack Creek July 2-5. On line of Chattahoochie River July 6-17. Siege of Atlanta July 22-August 25. Stoneman’s Raid to Macon July 27-August 6. Macon and Clinton July 30. Sunshine Church July 30-31. Ordered to Kentucky August 31, and operating against guerrillas in Green River counties till September. Burbridge’s Expedition into Southwest Virginia September 20-October 17. Saltsville, Va., October 2. Sandy Mountain October 3. Stoneman’s Raid into Southwest Virginia December 10-29. Bristol December 14. Abington, Va., December 15. Marion, Va., December 16. Near Marion December 17-18. Capture of Saltsville, Va., December 20-21. Jonesboro December 23. Clinch River December 24. 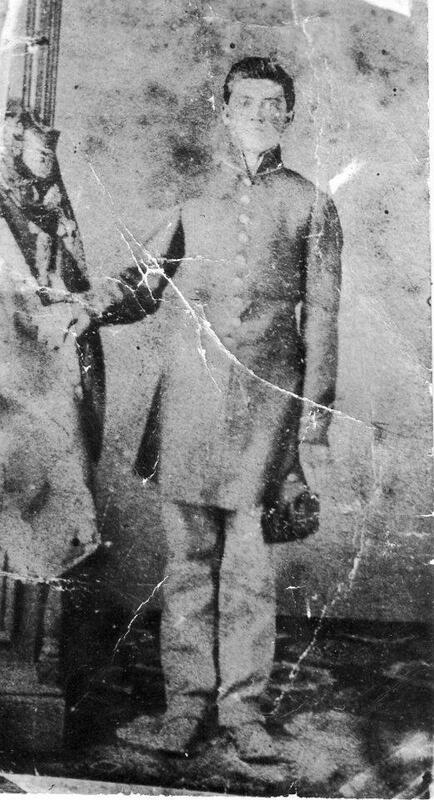 At Lexington, Ky., till February, 1865. Moved to Louisville, thence to Knoxville, Tenn., February 27-March 9, and to Strawberry Plains March 15. Stoneman’s Raid into Southwest Virginia and Western North Carolina March 21-April 25, 1865. Statesville, N. C., April 10-11. Shallow Ford, N. C., April 11. Salisbury April 12. Catawba River near Morgantown April 17. Howard’s Gap, Blue Ridge, April 22. Hendersonville April 23. Asheville April 25. Moved to Atlanta, Ga., thence to Louisa, Ky. Mustered out July 12 to 17, 1865.Regiment lost during service 1 Officer and 23 Enlisted men killed and mortally wounded and 2 Officers and 236 Enlisted men by disease. Total 262.12th Regiment, Kentucky Cavalry Overview: Organized at Caseyville and Owensboro, Ky., November 17, 1862. Attached to District of West Kentucky, Dept. Ohio, to June, 1863. 2nd Brigade, 3rd Division, 23rd Army Corps, Army of the Ohio, to August, 1863. Independent Cavalry Brigade, 23rd Army Corps, to November, 1863. 1st Brigade, 1st Division, Cavalry Corps, Dept. Ohio, to April, 1864. 3rd Brigade, Cavalry Division, District Kentucky, Dept. Ohio, May, 1864. 1st Brigade, Cavalry Division, 23rd Army Corps, to June, 1864. Detached Cavalry Brigade, 3rd Division, 23rd Army Corps, to August, 1864. Dismounted Brigade, Cavalry Division, 23rd Army Corps, to September, 1864. 1st Brigade, Cavalry Division, 23rd Army Corps, September, 1864. District of Louisville, Ky., to November, 1864. 2nd Brigade, 4th Division, 23rd Army Corps, to March, 1865. 2nd Brigade, Cavalry Division, District East Tennessee, to July, 1865. Cavalry Brigade, District East Tennessee, to August, 1865.